Press ‘Enter’ or Click on 'Login' Button. Select the Responsibility ‘System Administrator’. 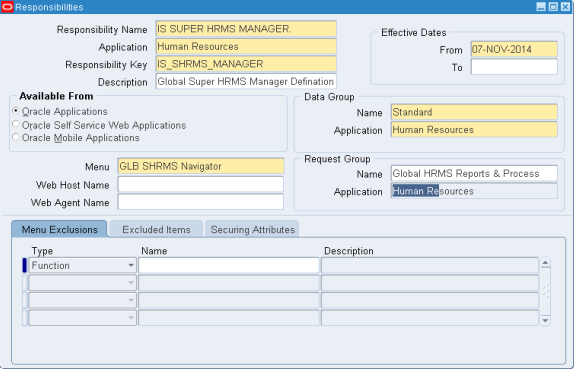 Press ‘F11’ and query with ‘Global Super HRMS Manager’ and press ‘Ctrl+F11’. 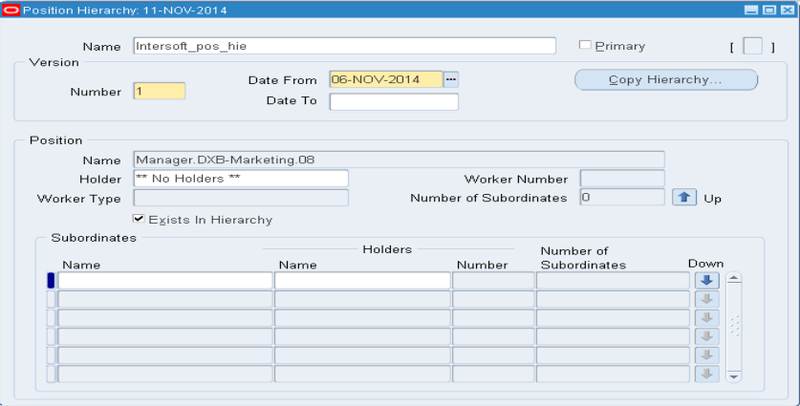 Create New Responsibility with the same menus and same data group with your name. Save it and close it. Give some name for the user and give a password. Attach your ‘ Human Resources ’ Responsibility, ‘ Application Developer ’ and ‘ System Administrator ’. Logout ‘SYSADMIN‘ and login with your username and password. Press ‘Enter’ or Click on ‘Login’ Button. As it is the first time of entering with the username system prompts you to change the password. Give the Old password, new password and confirm the new password. Now Press ‘Enter’ or click on ‘Submit’ Button. The following page appears with the Responsibilities you have attached to the user. Click on your ‘ Human Resources ’ responsibility. 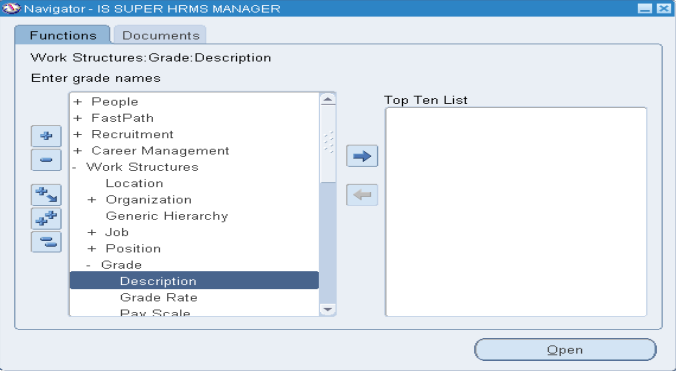 Specify the 6 Key Flexfield Structures that must be defined before you can define a Business Group in Oracle HRMS. Flex field Qualifiers are mandatory for Competence Flex field ( Human Resources) and Cost Allocation (Pay Roll). The important point which must do while defining flex fields is to Freeze and compile each and every Flex Fields after defining segments for it. Query with ‘Job Flexfield ’ in the ‘ Flexfield Title ’ and click ‘ Ctrl+↓ ’ in the below window displayed with predefined flex fields to create your own Flex field for ‘Job‘. Give a name for your Job structure and click on ‘Segments’ button. 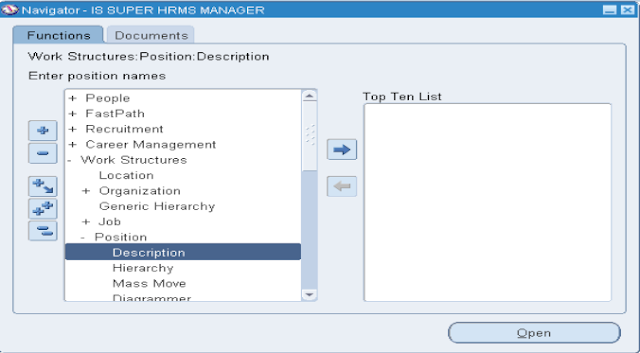 Define the Job structure for your Organization and check the required fields based on your requirement. Check the ‘ Freeze Flex field Definition ‘ and ‘Allow Dynamic Inserts ’ check boxes and Click on ‘Compile’ button. Query with ‘ Position Flex field ’ in the ‘ Flex field Title ’ and click ‘ Ctrl+↓ ’ in the below window displayed with predefined flex fields to create your own Flex field for ‘ Position ‘. 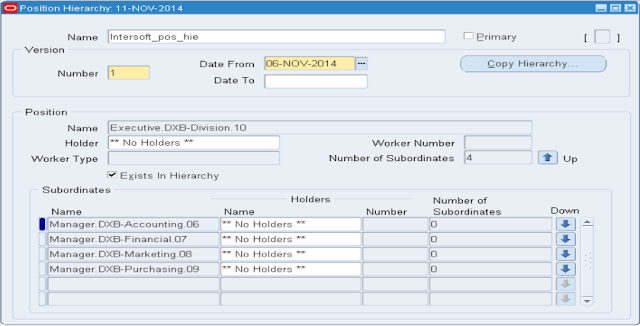 Give a name for your Position structure and click on ‘Segments’ button. Define the Position structure for your Organization and check the required fields based on your requirement. Query with ‘ Competence Flex field ’ in the ‘ Flex field Title’ and click ‘ Ctrl+↓ ’ in the below window displayed with predefined flex fields to create your own Flex field for ‘ Competence ‘. Give a name for your Competence structure and click on ‘Segments’ button. Define the Competence structure for your Organization and check the required fields based on your requirement. Flex field Qualifiers are mandatory for ‘ Competence Flex field ’. Click on ‘ Flex field Qualifiers ‘ button and select any one qualifier for the Competence. Save and close the window. Check the ‘ Freeze Flex field Definition ‘ and ‘Allow Dynamic Inserts ’ check boxes and Click on ‘Compile’ button. Query with ‘Grade Flex field’ in the ‘ Flex field Title ’ and click ‘ Ctrl+↓’ in the below window displayed with predefined flex fields to create your own Flex field for ‘ Grade ‘. Give a name for your Grade structure and click on ‘Segments’ button. Define the Grade structure for your Organization and check the required fields based on your requirement. Cost Allocation Flex Field is the interaction between Pay Roll and General Ledger . So the Segments which we are defining in HRMS should match with the Accounting Flex Field which we define in Financials. 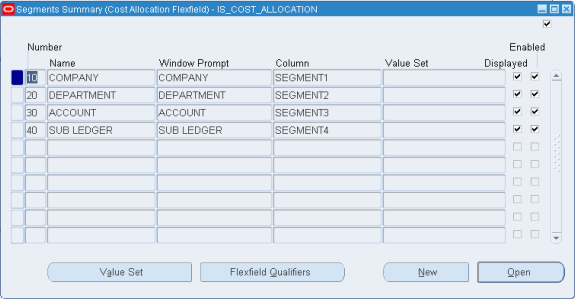 Query with ‘Cost Allocation Flex field ’ in the ‘ Flex field Title ’ and click ‘ Ctrl+↓’ in the below window displayed with predefined flex fields to create your own Flex field for ‘ Cost Allocation ‘. Give a name for your Cost Allocation structure and click on ‘Segments’ button. Define the Cost Allocation structure for your Organization and check the required fields based on your requirement. Flex field Qualifiers are mandatory for ‘ Cost Allocation Flex field ’ also. Check the ‘Freeze Flex field Definition ‘ and ‘Allow Dynamic Inserts’ check boxes and Click on ‘Compile’ button. 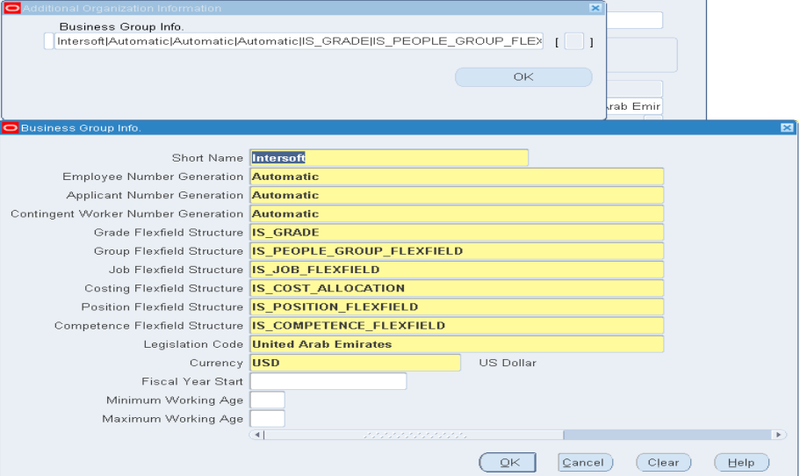 Query with ‘People Group Flex field’ in the ‘ Flex field Title’ and click ‘ Ctrl+↓’ in the below window displayed with predefined flex fields to create your own Flex field for ‘ People Group‘. Give a name for your People Group structure and click on ‘Segments’ button.Define the People Group structure for your Organization and check the required fields based on your requirement. Check the ‘Freeze Flex field Definition’ and ‘Allow Dynamic Inserts’ check boxes and Click on ‘Compile’ button. The next Step is to Create our Business Group. The Important thing we must not forgot while creating our business group and all our organizations is ‘Date Tracking’. The date must be checked while creating all the organizations . The dates which we give for our organizations must be after the date which our business group is created and the dates are those from which we want the organizations to be existed in our business group. 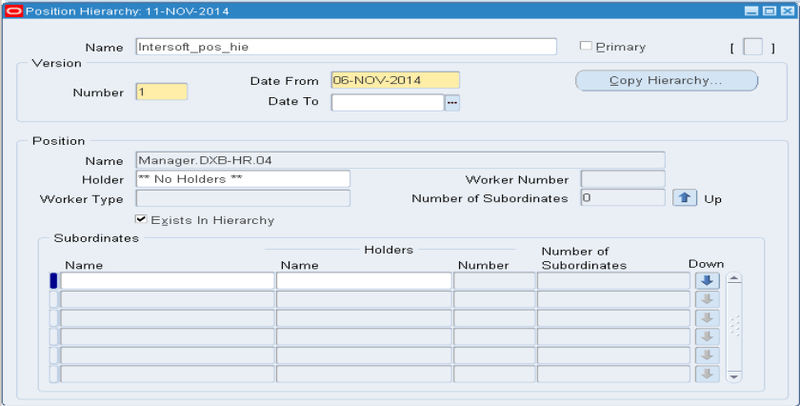 Note: The Date Tracking Plays a vital role in HRMS. The next step is to attach all our flex fields which we have defined before to our business group. 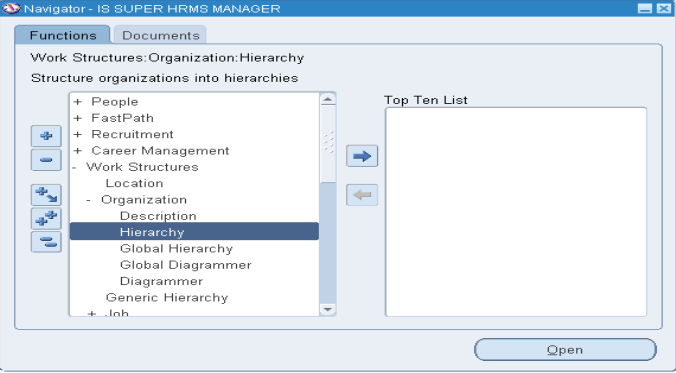 Organization Classification is Important in HRMS. 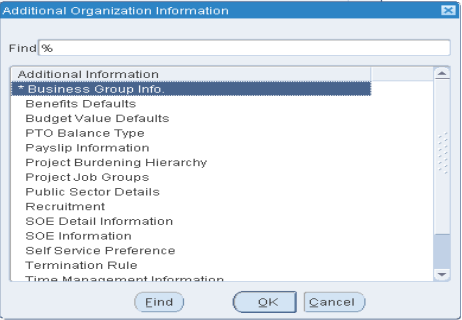 Enable the Business Group and click on ‘Others’ and give the Business Group Information. Give a Short name for the Business group. Select the Employee number , Applicant Number Generation, Contingent Worker Generation Fields as either as ‘Automatic’ or ‘Manual’ based on your business group requirement. 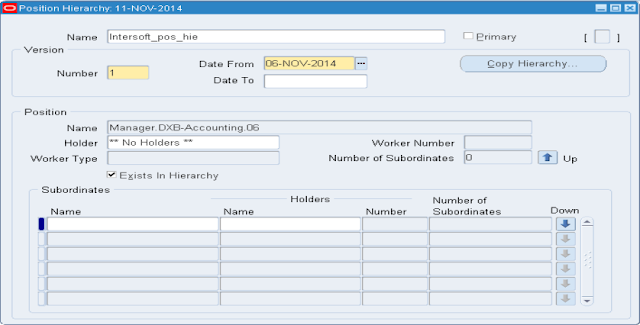 Select and attach your grade, people group, job, costing,position, competence flexfields to your business groups here. Select your Legislation Code and currency. Attach ‘HR Organization’ as well so that we can attach employees in that organization. Attach our business group to HR Security Profile. Under ‘HR Cross Business Group’ Profile Select ‘yes’. The next step is to create organizations in our business group. It will be better if we Select the Organization type while creating them. 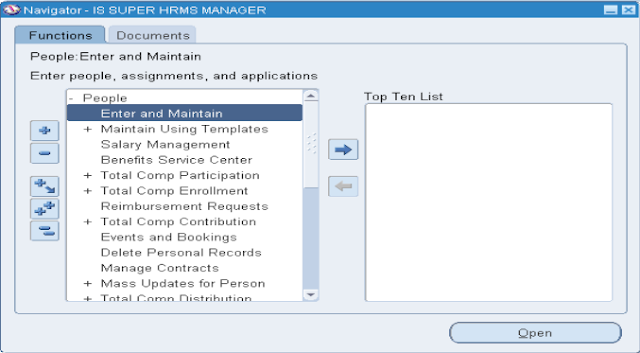 But Attaching HR Organization for every Organization is must. Create other Locations in your Business group. Now create all Divisions and Departments in your Business Group. The next step is to create a hierarchy for our organization .We must not forget date tracking. If we want to create a new hierarchy for our organization we will give an end date for our old hierarchy. The version name will be changed here. Give a name to the Organization Hierarchy and create the hierarchy. 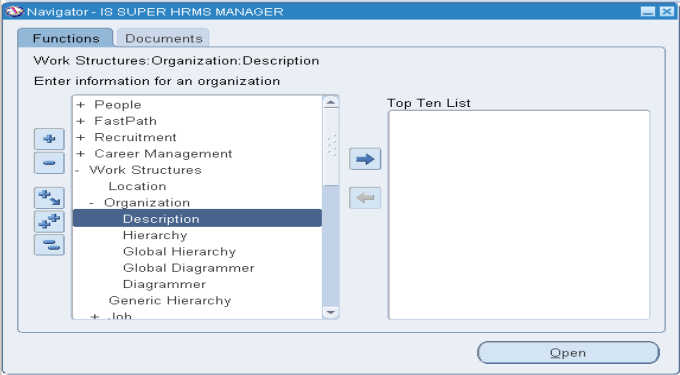 Select ‘Primary’ check box if it is the primary hierarchy of the organization. Select Version number as ‘1’ and give the starting date for the hierarchy. Query in the ‘Organization’ window with the Business Group Name and add all the divisions an departments as per the hierarchy in your organization in the ‘Subordinates’ window. Create the Jobs in your Business Group based in the Structure you have defined for the jobs. Job is a role in our organization. Here we will create jobs which we want in our organization. The job group will be generated automatically.But if we want a new job group we can create it by our self. Don’t forget to check the date. After creating the jobs with the job code and job name save them. Now click on Name field popup will display now add your desired job description on by one. The next step is to create positions in our organization. There r many differences between Jobs and Positions. 3) Jobs are independent of positions 3) Positions are dependent on Jobs. 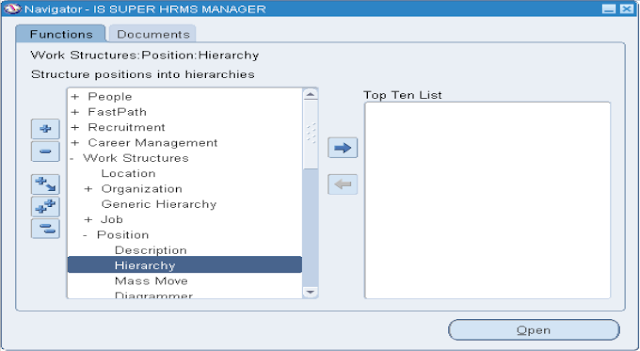 After creating the positions , create Position Hierarchy. Give a name to your hierarchy. If the Hierarchy is the primary hierarchy in your organization , check the ‘Primary’ check box .Save it and version number populated for it automatically. 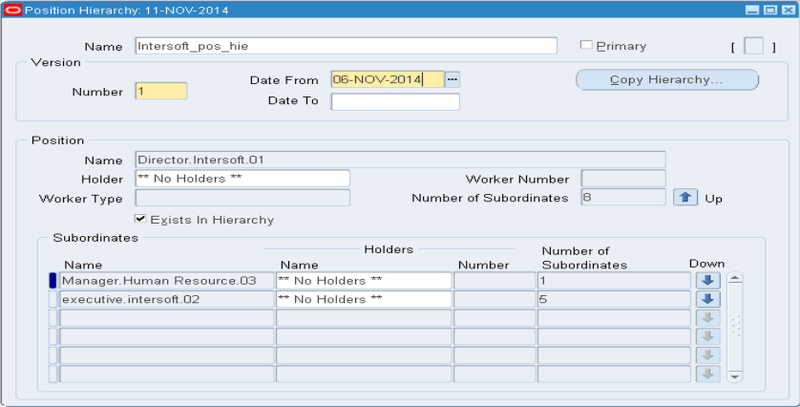 If you are creating first hierarchy give the ‘Date From’ . If we want to create another new hierarchy after some days , give the ‘End Date’ for the previous hierarchy which is running. Save it. 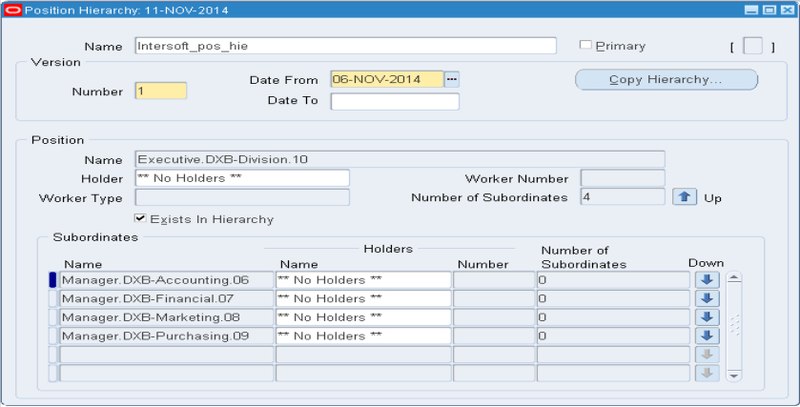 Query with Higher position name and attach the positions in the order as it is in your organization. The next step is to assign grades to the jobs in our organization. Grades can be assigned to jobs or positions. But Oracle prefers to assign grades to jobs. Here we will define all the grades which are available in our organization. The next step is to assign the grades to our jobs. Enter all the details of the employee. 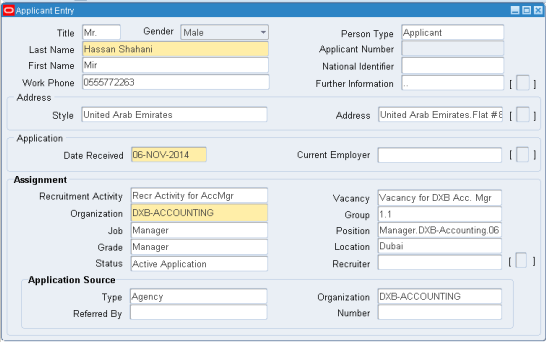 We can create Requisitions, vacancies and openings in our organization using ‘Requisition and Vacancy’ window. A requisition can be for one or more vacancies . Enter the requisition and save it before beginning to define the vacancy. Enter a name and number of openings for the vacancy. If you advertise vacancies using SSHR, enter the vacancy category. The vacancy is automatically advertised under this category. Optionally enter a description and select a status. You can select one or more assignment components to define the vacancy. Optionally enter the name of the recruiter. Optionally enter the budget measurement unit and value for the vacancy. The value you enter is for all the openings for that vacancy. We use ‘Requirement Activity’ window to define either single recruitment activity or more. Enter the details of the recruitment activity. You can enter the name of a ’parent’ recruitment activity in the Within Recruitment Activity region, if the activity you are defining is part of a campaign. 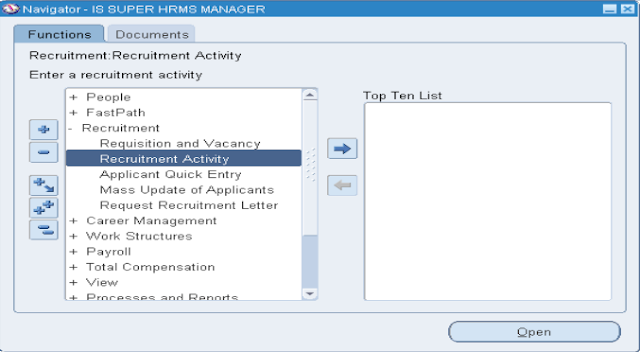 Choose the Recruiting For button to select one or more vacancies to associate with the activity. Entering the Applicant’s details : We use the ‘Applicant Quick Entry’ window to enter basic personal information and one assignment for an application. If we want to update this information or add further information , we use ‘People’ window. Enter the applicant’s name and an identifying number recognized by the system. Select a status for the application. 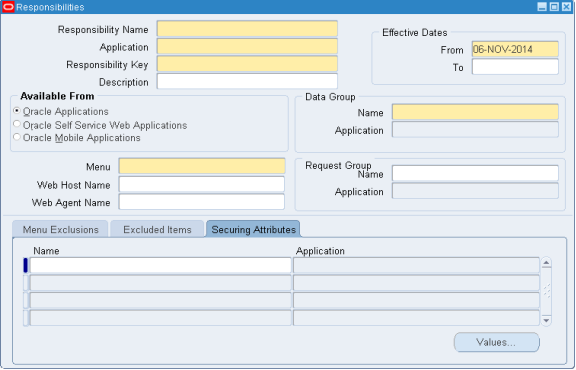 By default a new application has the status Active Application (or an equivalent user status defined on your system). All other fields are optional. Enter information in the Further Information field if your Oracle localization team has set it up. To enter an address, select a national address style. A window opens with the address format for the country you select. Enter the address lines and choose OK. The Date Received defaults to your effective date, but you can change it. This is the date the applicant’s record will begin. 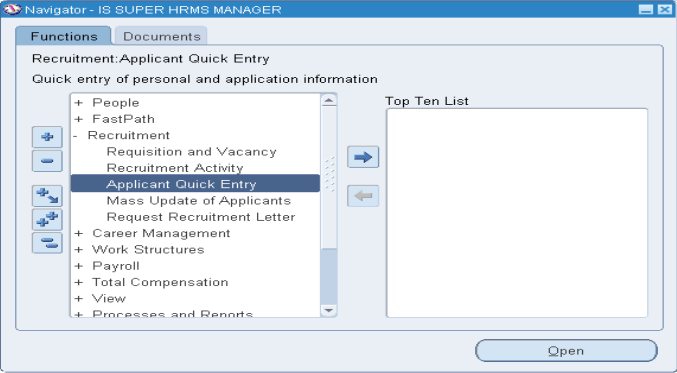 You can enter the name of the applicant’s current employer. You can select a recruitment activity. If there is only one vacancy for the activity, the vacancy details appear automatically. 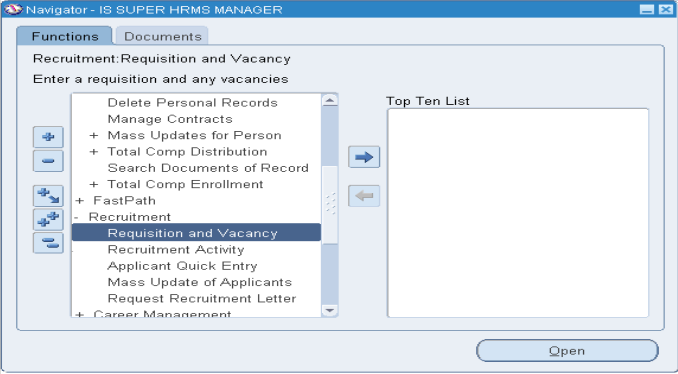 If you select a vacancy, applicant assignment information is displayed from the vacancy record. You can add to this information or change it. However, if you change it, the vacancy field clears. 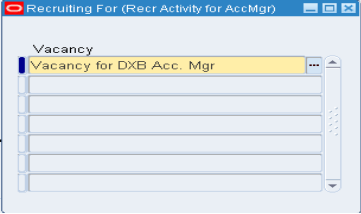 If you do not select a vacancy, you can enter assignment information in the Vacancy Applied For region. If you do not enter an organization, it defaults to the Business Group. 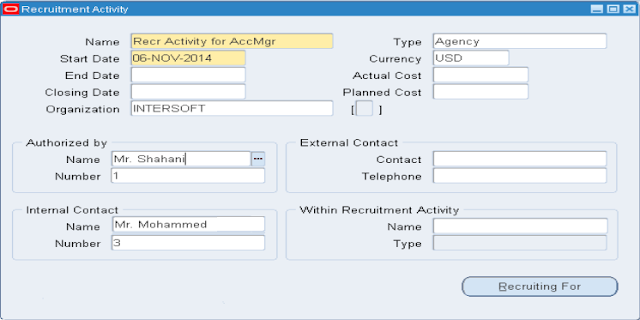 We can query and update the groups of Applicants assignments using ‘Mass Update of Applicants’ window. 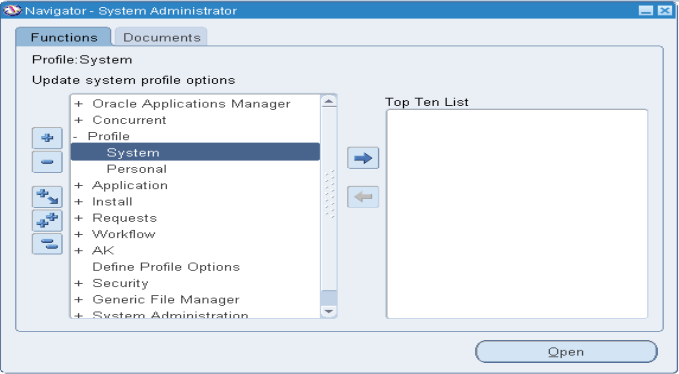 Select find from the Query menu to open the Find Applications window. Enter selection criteria for the group of applicants you want to update and choose the Find button. 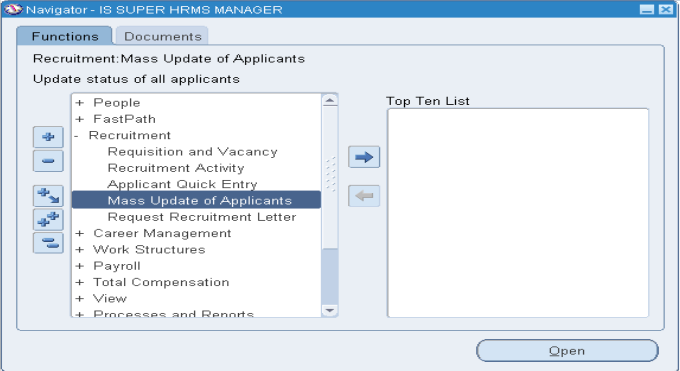 If you want to update all or most of these applicant assignments, choose the Select All buttons. 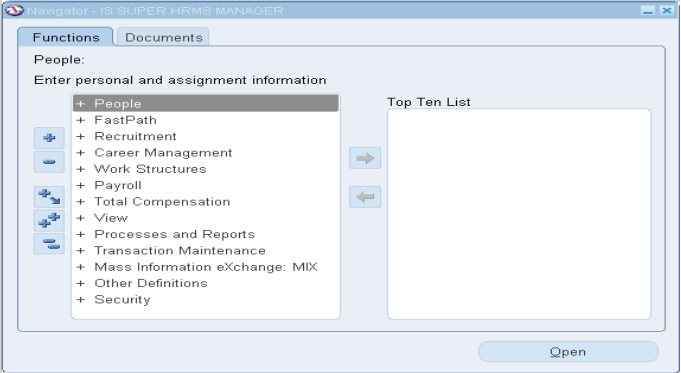 Then unchecked the Mark check box for any assignments that you do not want to update. If you want to update less than half of this group of assignments, check the Mark check box for each assignment you want to update. If you want to update the status of the selected assignments, select the new status. If you want to refer these applicants to a new recruiter, select the name of the Recruiter. Choose OK to affect the update. After Clicking on ‘ Update ’ button we will get the following window. Select an interview type, and enter the date of the interview in the Start Date field. You can also select a location and enter times and an end date. You are updating an existing interview record. Follow the same process till we give the ‘Offer’ to the applicants to hire them and the applicant may accept or reject it. If the applicant accepts the offer the next step is to hire the applicant as an employee. The main point to remember here is that there must be one day difference between the day the applicant accepts the offer from the company and hiring the applicant as employee.